The first Pimicikamak Cree Nation man to make it to the NHL came home to a celebration in his honour Wednesday. Brady Keeper made his NHL debut for the Florida Panthers late in the regular season, after the team had already been eliminated from the playoffs. The undrafted player was signed in March. The day he played his first game, Keeper’s father told CTV News his son was an inspiration in the community. 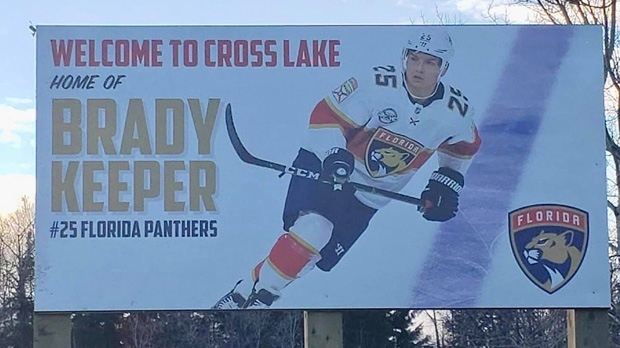 The defenceman came home to signs of their pride, including a billboard declaring Cross Lake as his home and homemade signs congratulating him. Manitoba Keewatinowi Okimakanak said his welcome home day schedule kicked off with his arrival at 11 a.m., followed by official events including a grand entry, ceremony and speeches in the community’s arena that began at 1 p.m.